Dewang Mehta, the ebullient President of Nasscom and son of India, had a blueprint for the IT industry and knew how it could be used effectively to change the lives of India’s teeming millions. He wanted the benefits of IT to reach to the grass root levels and his favorite slogan, ““Roti, Kapada, Makan, Bijli and Bandwidth”” epitomized the needs of the emerging, 21st century Indian. Mehta had recognized the potential of the software and services segment as a major foreign exchange earner and presented the country’s software industry to the world. Under his leadership Nasscom become the key voice of the Indian software and services Industry and he managed to push through an extensive software industry wish list such as zero duty on software imports, to crucial income tax concessions for software exporters, to stringent Copyright Laws, the introduction of the IT Act and resulting cyber laws. Mehta also played the role of the guru, guiding the central and state Governments in their path towards IT-fication. He helped at least 19 state Governments draft their IT policies and create the requisite infrastructure. 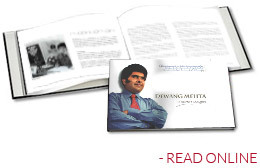 It was almost after one year of the untimely demise of Dewang, The Dewang Mehta Foundation (DMFT) was created to fulfill Dewang’s dreams of an IT literate India.